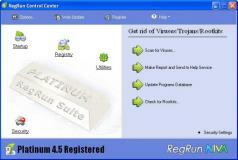 RegRun Security Suite Standard is a powerful malware removal tool that includes backup and restore functions as well. It can detect and get rid of malware from your system’s HDD, and offers options for saving logs, managing startup items and file recovery and protection. The tool lets you initiate computer scans that will detect worms, rootkits, Trojans, malware, adware and other digital threats. Although the interface of the application is straightforward enough to be used with ease regardless if you’re technically experienced or not, RegRun Security Suite Standard also offers comprehensive help documentation to guide you on how to use it properly. The application can scan the entire contents of your hard drive for malware and all suspicious and/or infected items will be listed in a dedicated window. You can delete those items if you want to but also keep them, depending on the case. RegRun Security Suite Standard can save logs as TXT, HTML, XLS or CSV files to the location of your choice. Furthermore, it lets you create backups and remove registry keys. The program also allows you to display and manage all Windows startup items accompanied by relevant information like their full path, type, value name, manufacturer and product. You can save your custom settings within the application and/or save them to a file so you can reload them if need be. Items can be recovered from the Internet, local drives, CDs or from a backup. The tool comes with even more options, like the ability to enable/disable AutoRun, a search function, protect DLL, SYS, INI and BAT files and create a blacklist among others.